Hi everyone! Sorry for the delay in posting this morning...time seriously got away from me! 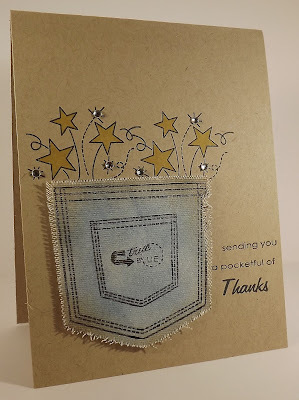 :-) Today I'm sharing a card using the 'oh-so-fun' A Pocketful stamp set and A Pocketful die from Wplus9. Is this not the most fabulous set and die!! To create my jean pocket I started by cutting the pocket shape out of sticky back canvas. The canvas was perfect for creating the jeans look! I then used my Faded Jeans Distress Ink and blending tool to add color to the canvas. A hint of Walnut Stain on the edges gave the pocket that well worn look...well...that and fraying th edges of the pocket by pulling a few threads from the canvas. 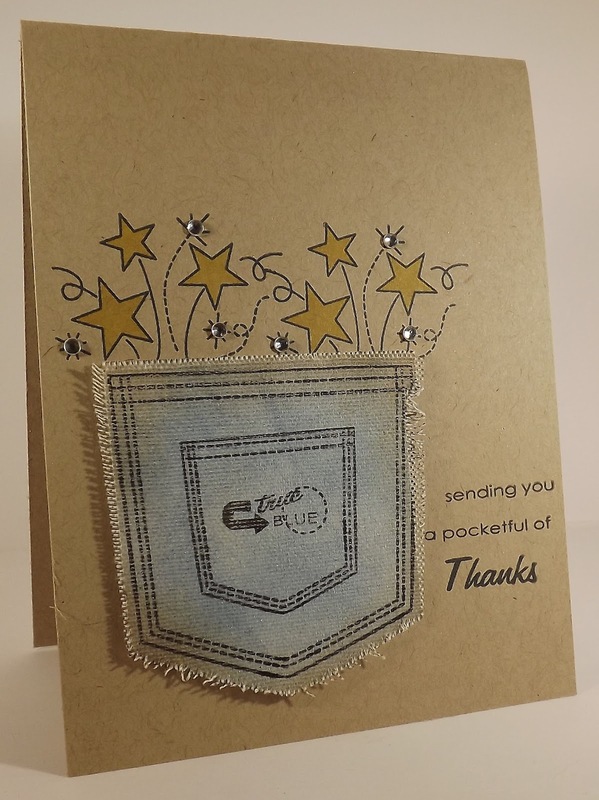 Since Wplus9 stamp sets are clear, I was able to create the pocket (the jeans image was created with three individual stamps...yes, you can have your jeans pocket your way!) by laying out all three stamps on my pocket and pressing down with my Stamp Press to pick up all three stamps at once...creating my own design that just needed ink! I created the sentiment in the same manner. The last step was to fill my pocket and I opted for the shooting stars. To line up the pocket fillings, just place the pocket on your card and then line up the stamp...already inked. Gently remove the pocket and stamp! I colored the stars with Copics, added a few rhinestones, and attached the pocket with foam tape. Super fun, right? Check out all of Wplus9's fabulous products! This is wonderful!! I love it! It's just so perfect in it's simplicity! !